Home Gadgets Gaming COUGAR releases QBX: The Most Advanced Compact Gaming Case on the Market! COUGAR releases QBX: The Most Advanced Compact Gaming Case on the Market! 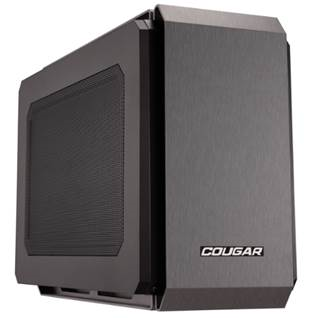 COUGAR has just announced the arrival of COUGAR QBX, the most advanced compact gaming case on the market. This Mini-ITX case stands above the crowd for three reasons: its compact dimensions, its expandability and the best cooling on the market for a case of its size. The first of QBX's virtues is self-evident. Its 178 x 260 x 368 mm make QBX a highly compact case. With it, gamers no longer need enormous desks with lots of space to install high-end gaming components in order to enjoy new generation games. Whether on a desk or near the TV, QBX will fit in any gamer's room and leave them space for a bigger screen or whatever they want to do with it. The second of QBX's distinguishing features is what makes it a gaming case. A compact case with very good cooling is great, but virtually all of those are limited to smaller components with limited capabilities, which makes it impossible to enjoy the most demanding games. QBX shatters that limitation, allowing the user to enjoy high end graphics cards (up to 350mm long), up to five hard disks (both HDD and SSD), Slim ODD for different media formats, USB 3.0 and much more. All this is well powered, since QBX supports PS2-ATX PSUs (up to 140mm long), which can fuel even the most demanding system and can also be easily found anywhere, in contrast with the special PSUs required by other compact cases. In short, QBX allows gamers to fully enjoy the latest generation of games without worrying about hardware limitations. Last but not least, all this power needs to be well cooled or all those components in a small space would simply burn themselves. QBX solves this problem with what is the best cooling on the market for a case of its class. Up to 7 fans with possibility of installing water cooling (up to 240mm long) will provide all the required airflow, including a dedicated independent PSU airflow that prevents the air from that particularly hot part of the computer to get to the rest of the components. The QBX's pro-cooling design guarantees that this airflow gets to the right places through the right ways, optimizing cooling even further. This revolutionary gaming case will be available starting in late April.